Stocks: Let's hear it for May! Wall Street's traditional "Sell in May and go away" advice won't likely apply in 2013. Barring a massive sell-off Friday, the major U.S. indexes will end the month with solid gains. So far this month, they're up between 3% and 4%, bringing their advance for the year to a hefty 16%. U.S. stock futures were lower Friday, one day after markets edged higher. Investors close out the week awaiting a handful of economic reports. The Commerce Department said both personal income and spending decreased slightly in April. Economists surveyed by Briefing.com had predicted a modest increase. The latest edition of the Chicago Purchasing Managers' Index will be released at 9:45 a.m., followed closely by a report on consumer sentiment from the University of Michigan and Thomson Reuters. In corporate news, Nasdaq said Netflix (NFLX) will join the Nasdaq-100 (NDX) on June 6, replacing healthcare supplier Perrigo (PRGO). Lion's Gate (LGF) shares rose after the media company said sales jumped 71% in the past fiscal year, helped by teen-oriented franchises Hunger Games and Twilight. Shares of Palo Alto Networks (PANW) plunged after the technology company swung to a big loss in the most recent quarter. 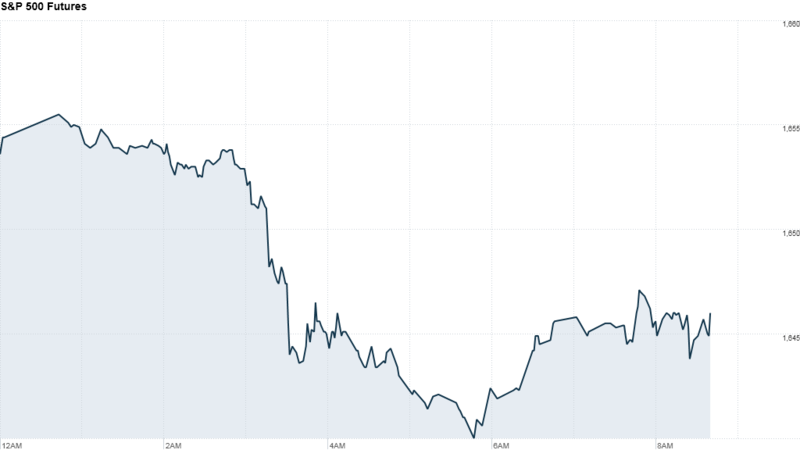 European markets took a tumble in midday trading. Benchmark indexes in France, Germany and the United Kingdom were all off by roughly 1%. Unemployment in the troubled eurozone region hit a record high of 12.2% last month, according to the latest statistics from Eurostat. Asian markets ended the week with mixed results. The Nikkei advanced by 1.4%, rebounding from Thursday's steep decline brought on by mounting concerns over the country's economic turnaround plan. The Hang Seng dipped by 0.4% while the Shanghai Composite index fell by 0.7%.